Pair of Italian crystal floral or flower wall sconces with gold painted backplates, in the style of Bagues. 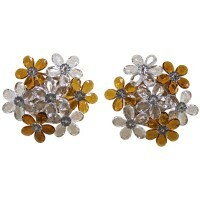 Crystal flowers alternating in clear and amber. Each uses a single 40-watt max candelabra base bulb Newly wired.